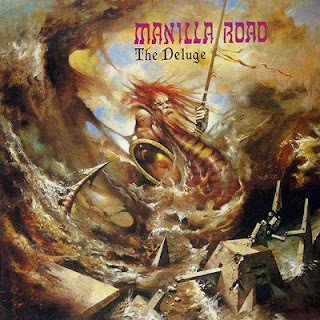 There was a clear evolution in Manilla Road's sound that was first evidenced when their masterpiece "Crystal Logic" hit the metal underground, and they would follow it up with an equally amazing record in "Open the Gates," and only a year later they would release their fifth full-length in "The Deluge." Much like the albums that preceded this record, there was still an ongoing evolution to the band's sound and if you recognize the year this record was released then it should come to no surprise that "The Deluge" embraced the rapidly rising aesthetics of the thrash subgenre to essentially deliver an awesome album that carried on the epic style from its predecessors while injecting a sizable dose of thrashy goodness, without forsaking any of the tenets of what made Manilla Road's earlier output so damn good. 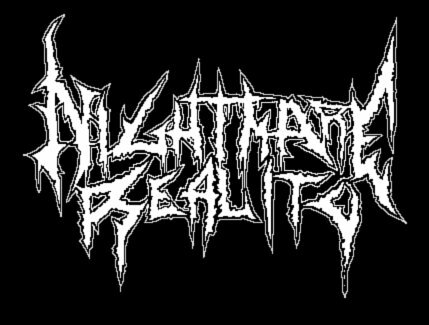 It would definitely be a stretch to consider this material thrash, but more along the lines of what the early US power metal bands (Omen, Jag Panzer, Attacker, etc) were doing, incorporating fantasy-themed lyrics with faster and heavier riffs than typical heavy metal bands. Much like "Open the Gates," Randy "Thrasher" Foxe lived up to his nickname again on "The Deluge." The opening track "Dementia" immediately showcases the man's intense and sporadic drumming which contributed greatly to Manilla Road's faster and heavier sound. Shelton also took pleasure in kicking the tempo up a notch, delivering thrashy riff after riff. One of the band's most memorable songs "Divine Victim" has upbeat riffs that are incredibly catchy, almost reminiscent of thrash acts like Anthrax or (early) Overkill, not to mention one of Shelton's best solos (and this man has a lot of 'em). "Taken By Storm" doesn't have any complicated structures or span 7-8 minutes, but its the perfect example of what Manilla Road accomplished with this album; it consists of mainly midpaced to fast riffs, yet it still retains the epic vibe that songs like "Witches Brew" or "Crystal Logic" had. "Hammer of the Witches" also proves to be one of Shelton's heaviest tunes yet, featuring crushing riffs and a stellar chorus that shouts "Burn them all!" in his signature voice, which proves to be just as strong as ever, even showing slight improvements from "Open the Gates." And how could there be a Manilla Road album without a ton of solos and clean interludes? "Shadows in the Black" features Shelton's more soothing vocal stylings over the clean guitar before it eventually turns into another thrashy onslaught, while "Isle of the Dead" uses the clean guitar tone for a more sinister atmosphere that conveys the title of the track tremendously. Then there's the brilliant title track that lives up to the epic songs that came before it, as Shelton conjured up some jaw-dropping solos, magnificent vocals and plenty of memorable riffs that were executed flawlessly. The album closer "Rest in Pieces" is a wicked shredding piece that only furthers Shelton's legacy as a god with the guitar. While "The Deluge" is a notch or two below "Crystal Logic" and "Open the Gates," its still an incredible record worth the time of any Manilla Road fan, and it ranks up there with some of the best metal records released in 1986.